Fact 1: The first official surf contest took place in Corona Del Mar, California. Fact 2: George Freeth is the person that brought surfing to California. Fact 3: Surfing was originated by the oceanic culture island of Polynesia, and was first discovered by Captain cook in 1778. 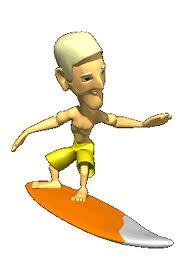 Fact 4: There are two types of surfing; short boarding and long boarding. Fact 5: Short boarding is harder because it requires more effort. Fact 6: Kelly Slater is the highest paid surfer with his 11 world titles his net worth is somewhere around 25 million. Fact 7: First University to offer a degree in surfing is the University of Plymouth. Fact 8: When the waves get over the surfer it;s called “getting barreled” because you can’t go right or left, just straight. Fact 9: The biggest wave recorded was 530 meters in Lituya Bay Alaska. Converts to: 1,738.84514435695 feet! Fact 10: The longest ride ever done on a wave was 37 minutes in Pororoca. This entry was posted in Local Favorites, ocean conditions, San Clemente surf, Surf Content, surfing and tagged Alaska, California, corona del mar, George Freeth, Kelly Slater, long board, Plymouth University, Polynesia, Pororoca, short board, Sport, surf, Surfing, surfing facts, University of Plymouth, Water Sports. Bookmark the permalink. Kudos for mentioning Lituya Bay. And it was effectively surfed! By a couple fishermen in a boat (alas, not a surfboard).